Gary Dale Higginbotham, 66, of Durham, NC (formally of Wyatt, WV) passed away unexpectedly Monday, Nov. 13, 2017. He was born in Falsom, WV. Gary was the son of the late Ross Higginbotham and Glenna Marie Weekly Higginbotham. On February 14, 2004, he married his sweetheart, Carolyn Spinks Higginbotham, who survives him. He is also survived by his children: Carrie Ann McDougal and husband, Chad of Fairmont, WV and grandchildren Emily, Spencer and Anna; Charles Higginbotham and wife, Stacey of New Caney, TX and grandson Logan; Joe Spinks and wife, Sherri, of Hillsborough, NC and grandsons Dale (Clair) and Gray; Crissy King and husband, David, of Mebane, NC and fur baby, Sammy. Mr. Higginbotham is also survived by his brother Ross Higginbotham Jr. (Ruth), sisters Libby Fluharty, Joyce Sickles, Sue Liggett (George), Betty Cain (Gene), Katy Gump, Debbie Lou Liggett (Jim), and many nieces and nephews. Mr. Higginbotham was preceded in death by brothers Eugene Kuhens, Sanford Kuhens, Byron Higginbotham, and Henry Higginbotham. He was dedicated to his family and work at University Ford of Durham. He enjoyed cooking and watching UNC sports. A visitation will be held on Thursday, Nov. 16, 6-8pm at Clements Funeral Home in Durham, NC. In lieu of flowers, the family requests that memorial contributions be made in Mr. Higginbotham’s memory to The American Heart Association: 4217 Park Place Court , Glen Allen, VA 23060- 9979. 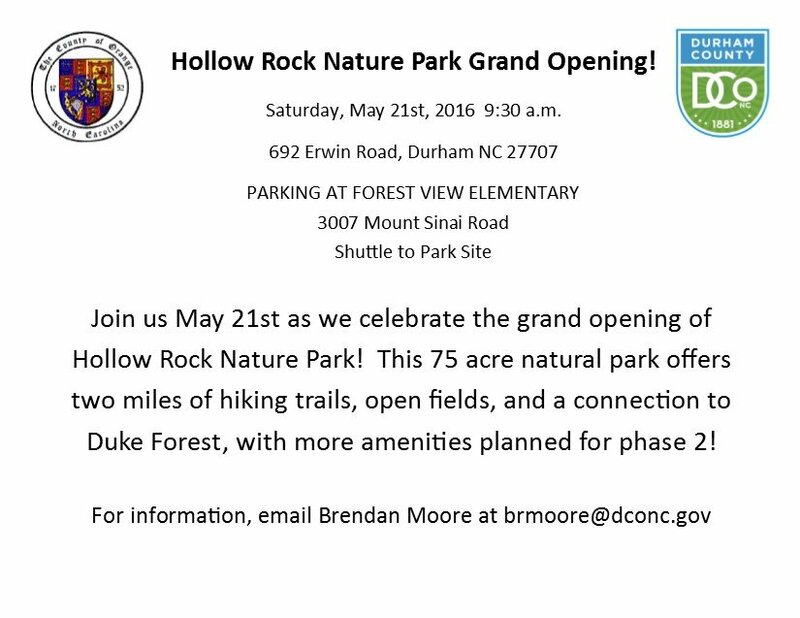 Hollow Rock Nature Park Grand Opening! 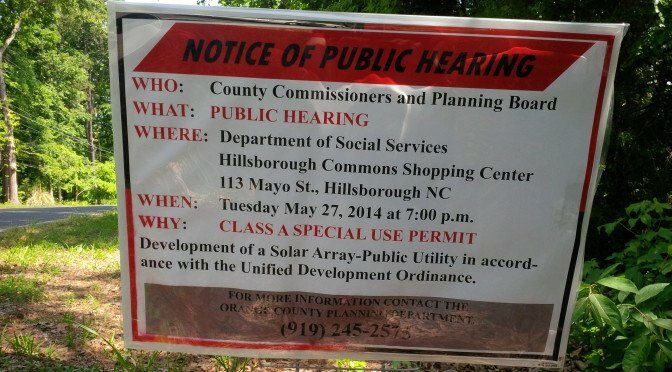 Did you know that there is proposal on the table for the construction of a Solar Array off of Mt. Sinai Road with access via Cascade Drive? The meeting agenda is available here and includes the details of the project, maps, and a variety of support materials.